Docetaxel-induced peripheral neuropathy (PN) can lead to sub-optimal treatment in women with early breast cancer. Here, we compare the frequency of dose reduction as a result of PN in two different adjuvant regimens. 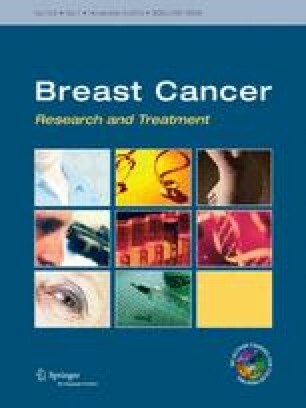 From the Danish Breast Cancer Cooperative Group READ trial we included 1,725 patients with early stage breast cancer who randomly were assigned to three cycles of epirubicin and cyclophosphamide followed by three cycles docetaxel (D100) or six cycles of cyclophosphamide and docetaxel (D75). Eligible patients completed chemotherapy, received docetaxel, and provided information on patient-reported outcome (secondary outcome of trial) including PN. Associations between PN and risk factors were analyzed by multivariate logistic regression. Overall 597 patients (34 %) reported PN, grades 2–4, during treatment, 194 (11 %) after the first cycle [early onset peripheral neuropathy (EPN)] and 403 (23 %) after subsequent cycles [later-onset peripheral neuropathy (LPN)]. The odds ratio (OR) of EPN was significantly increased for the D100 regimen (OR 3.10; 95 % CI 2.18–4.42) while this regimen was associated with reduced OR of LPN (OR 0.69; 95 % CI 0.54–0.88). Patients with PN received significantly lower cumulative doses of docetaxel than patients with no PN. Explorative analysis showed that OR of PN was significantly reduced if patients wore frozen gloves and socks during treatment (OR 0.56; 95 % CI 0.38–0.81) in the EPN group. Patients developing PN after the first cycle are less likely to receive docetaxel at the planned dose intensity and usage of frozen gloves and socks may modify the risk. The READ trial/Danish Breast Cancer Cooperative Group received an unrestricted grant from Sanofis-aventis. Bent Ejlertsen MD, has received unrestricted grants from Norvatis, Amgen, and Roche. All other authors have no conflict of interest.